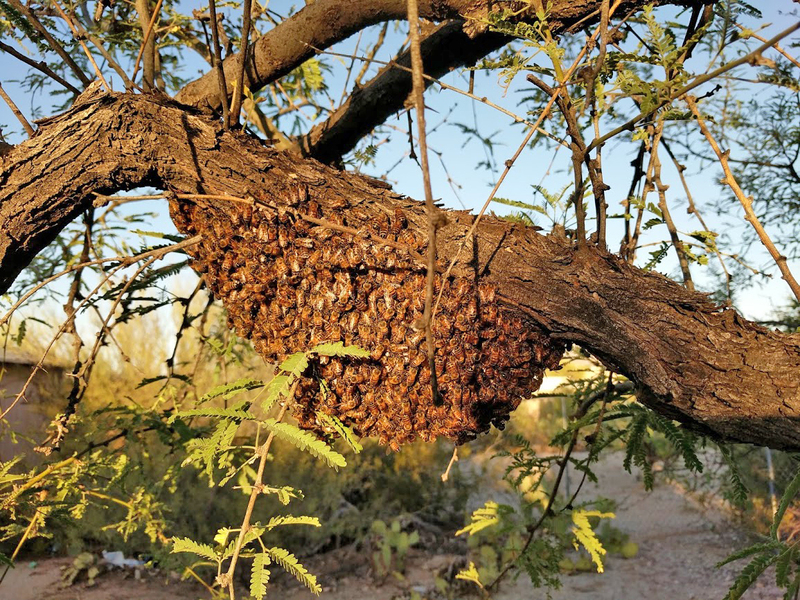 The Southern Arizona Beekeeping Association is dedicated to maximizing public safety through education and community engagement with regard to wild honey bee colonies. Tragically each year in the United States and beyond, several people are killed due to unintentional disturbance of honey bee colonies. We are both saddened and very concerned when this occurs. A large number of these attacks are preventable, and there are various strategies that you can employ to reduce the likelihood of injury. Developing an ongoing plan of action to reduce potential hazards requires broad and proactive community outreach with accurate information. We respectfully request that the general public, including media, law enforcement, and local leadership first considers this source of information before issuing public statements about this unique challenge. A person’s chance of running into wild honey bee colonies in the desert southwest is higher than other parts of the country. However, the chances of dying from honey bee stings in your lifetime is several times less than getting struck by lightning, The Africanized hybrid strain thrives best in our particular climate with low rainfall, and mild winter temperatures. Even more so around urban areas where people have provided water, numerous man-made cavities, and flowers that are not indigenous to the Sonoran Desert. Unfortunately following each accident, insufficient or inaccurate information hastily bubbles forth through standard media channels. While we feel that this is largely unintentional, we also understand that – save for some highly experienced beekeepers, pest control operators specializing in honey bees, and honey bee researchers – the general public, media, law enforcement, and local leadership does not have the expertise needed to accurately determine the causes of these attacks or to prevent them in the future. Information disseminated by these sources should be taken with a fair amount of caution. Despite extermination, swarm trapping, and live relocation by pest control companies and experienced beekeepers, the population of wild Africanized colonies can be expected to increase in warmer regions of the United States (see current map here – note: it has not been updated since 2011). By “wild” we mean to say: colonies not managed by beekeepers in beekeeping equipment with moveable combs or frames. It is important to note the use of the term “swarm” by the general media. 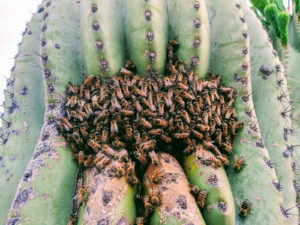 Typically, when an attack occurs, it is usually said that the victim was “swarmed”, or that the victim was attacked by a “swarm that was passing through”. Occasionally we are given the impression that a group of honey bees “appears out of nowhere” to attack a victim. In almost all cases these claims are false because true honey bee swarms do not viciously attack. Instead, established hives easily found by most beekeepers are at fault. These hives have usually been established for more than a few months since it takes a while for a swarm to establish itself as a hive and defend its home more forcefully. 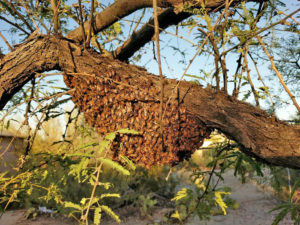 A swarm is almost always completely docile regardless of whether they are of European or Africanized origin. A swarm is a group of honey bees without a home, brood, or honey combs to protect, and they are looking for a more permanent home. In terms of massive stinging incidents, a swarm of honey bees is of very low public risk compared to an older established colonies of honey bees that are usually found in some sort of cavity like a block wall or under shed floor. Regardless, you should not attempt to move or exterminate honey bees yourself. Call someone experienced in dealing with honey bees – they need to be dealt with in very specific ways to ensure safety. Africanized honey bees (AHB) are not a pure strain from the African continent. They are a hybrid or genetic mix between docile European strains and the original African strain. Overtime they can have a disproportionate number of African traits since they can out-compete European strains if left unchecked. The temperament of Africanized honey bees can vary from being completely docile to extremely aggressive, including a good proportion having a temperament somewhere in between. It is more unusual for European strains of honey bees to exhibit highly aggressive behavior, but not unheard of. The venom of both European and Africanized honey bee strains are identical. However, more aggressive strains of honey bees recruit more of the colony to attack as a chemical pheromone marker is emitted during the act of stinging. The most active ingredients in honey bee venom are mellitin, histamine, and other proteins. The only way to determine with certainty that a particular colony is Africanized is through genetic testing or morphometric analysis of the wings under laboratory protocols which are typically unavailable to the general public at this time. The level of aggression that a hive might exhibit is more extreme the larger the hive population due to a higher percentage of older bees experienced in guarding the hive. 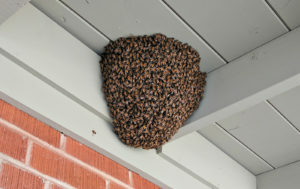 Higher swarming rates can also be related to their tolerance for smaller cavities in which they establish their hives. Hives bound by smaller cavities swarm sooner and more often. They are better at foraging for food than European strains. They are better at tolerating pests like Varroa mites leading to higher survivability rates. They produce more baby bees (brood) earlier in the year and more quickly. Africanized virgin queens pupate and emerge from their cocoons (cells) faster than those with more European ancestry. The first queen to emerge kills the rest before they emerge. They are more active at guarding and patrolling the surrounding area around their hives. The term “Africanized” is used to describe a hybrid (or a genetic mixture) of the original African strain (Apis Mellifera scutellata) and strains brought by the Portuguese and Spanish in the 15th through 19th centuries (Apis Mellifera iberica, and ligustica) which were used up until the mid-1950’s in Brazil for honey and beeswax production. Today European strains continue to hybridized with Africanized honey bees – primarily the Italian honey bee (Apis Mellifera ligustica) which was brought into the US around the mid-nineteenth century to replace the German Black Bee (Apis Mellifera mellifera) originally brought by Western European colonialists in the early to mid-17th century. While Africanized strains do have a mating advantage over European counterparts, that’s not to say that diluting aggressive drones in mating areas is not possible. Those of us involved in relocating honey bees routinely notice higher instances of aggression in wild colonies the further they are from higher densities of beekeepers. Beekeepers are the ones actively propagating gentle drones without the alleles responsible for aggression. For this reason it’s essential that properly trained beekeepers continue to participate in keeping gentle colonies of honey bees. These bees have chosen to build their combs out in the open as opposed to an enclosed space. Although you cannot prevent a swarm from landing on trees or other structures, the swarm can be collected as soon as possible which prevents them from building a hive in place. Depending on the beekeepers technologies, swarms and fully exposed hives higher than 15-20 feet may be too high to relocate without significant cost and risk of falling. The hole provided for a padlock is a favorite entrance. Rip-rap around the box allows access points. These boxes are essentially swarm traps placed at every residence and in all rights-of-ways where public utilities are needed. We have established a vast network of them throughout the city, and very few are actually locked at any given time. Care to reduce your liability as a landscaping company? Keeping the lock hole on irrigation and water meter boxes sealed with duct tape, wire mesh, or stuffed with steel wool is among the easiest ways to reduce the number of swarms establishing around urban areas. Good contact between the box and surrounding soil is essential. Swarms like to access fairly insulated spaces through thin gaps and attach combs under the flooring between two floor joists where they can reach a fairly large population due to ample space. Filling the space between the floor joists is the best solution if you are building and placing yourself. Otherwise, some means of sealing all cracks between the ground and the wooden support is the best bet. 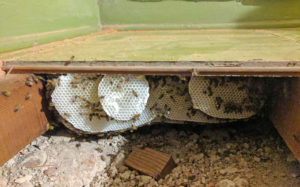 The screen covering “bird board” or “frieze board” frequently falls out or gets damaged, giving bees direct access to large cavities between ceiling joists. Gaps between wood supports are also common due to constant expansion and contraction of wood due to moisture content and house settling over time. Swarms only need ¼” gap to access a cavity. Inspect all screens to ensure they are in place before and after swarm season, and keep all gaps between support beams and boards sealed tight with a type of caulk or other wire mesh. Wash banks and other ground cavities are sources of large numbers of wild colonies. Washes and river systems are a primary way that AHB can extend it’s reach into new territory. These areas are the first to green up and produce food for honey bees since it’s where water collects. Limited leaky fixtures or other sources of water can help. Fortunately, except for hikers, ranchers, or construction workers, people do not frequent washes nearly as much as the other locations noted. These areas would be prime location for placement of colonies meant to produce gentle drones. 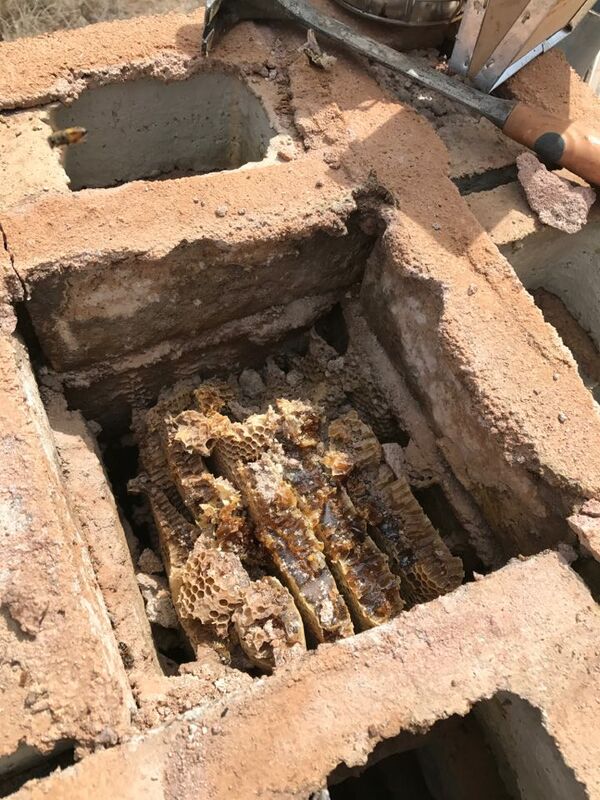 Over time block walls crack when the footing is compromised, giving bees access to the hollow spaces in the block which are rarely filled in with concrete. Keep all cracks patched or backfill interior spaces with sand or other material. Vigas (wood poles) crack due to moisture changes and sun exposure, and provide an entrance through the exterior stucco and into the hollow wall. Inspect before and after spring to keep all cracks leading into the wall patched with a caulk material. *Certain trees are prone to hollowing out as they age. The extent of the resulting cavity is frequently hard to determine which makes the hive location and size hard to assess unless a lot more time and creativity is employed. Dealing with heavy sections of trees is also dangerous. *Keep all hollow spaces filled and avoid planting certain types of trees (see below). The highlighted upper half of the table represents situations that have the highest probability of safe live relocation by a beekeeper. Locations/Structures that have been bolded tend to be more common than other situations. The other scenarios require special precautions and require much more experience due to level of difficulty. In some cases where time is very limited, or when the infested structure is very difficult to open safely, an extermination may be the only option. 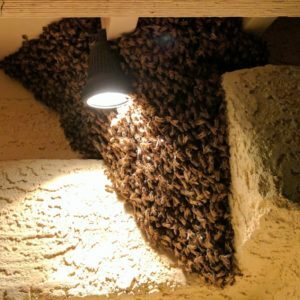 If you are not sure, you may contact a beekeeper at the Tucson Beekeepers Facebook group, or from the list of those conducting live relocation on the Swarm Removal tab here. Note that this list is not all-inclusive. 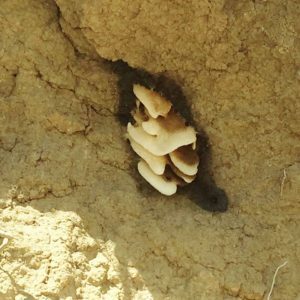 There are many other types of structures that honey bees swarms will use to build a hive, and the Africanized strain is willing to use cavities and locations that European strains consider less ideal. 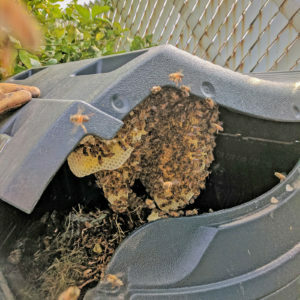 Compost bins, hot tubs, abandoned automobiles, under mobile homes, boats, birdhouses, overturned flower pots, drainage pipes, cardboard boxes, old dressers, and sofas are other places honey bees commonly take up residence. Keeping your yard free of clutter, and your home well sealed goes a long way towards keeping honey bees out. 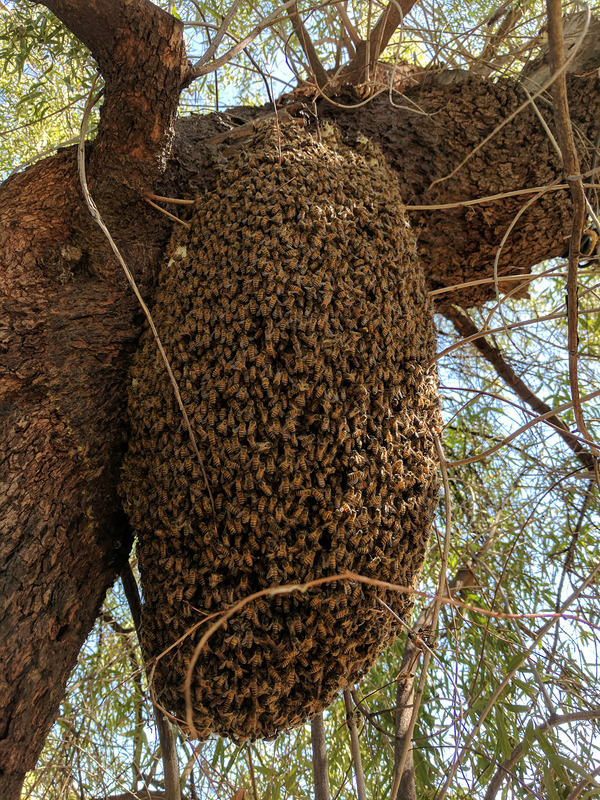 *The following trees are more prone to developing large interior cavities that bees like to make homes in: tamarisk, mulberry, olive, and cottonwood. Consider replacing these, or make yearly inspections to ensure all cavities are filled or covered to prevent swarms from entering. 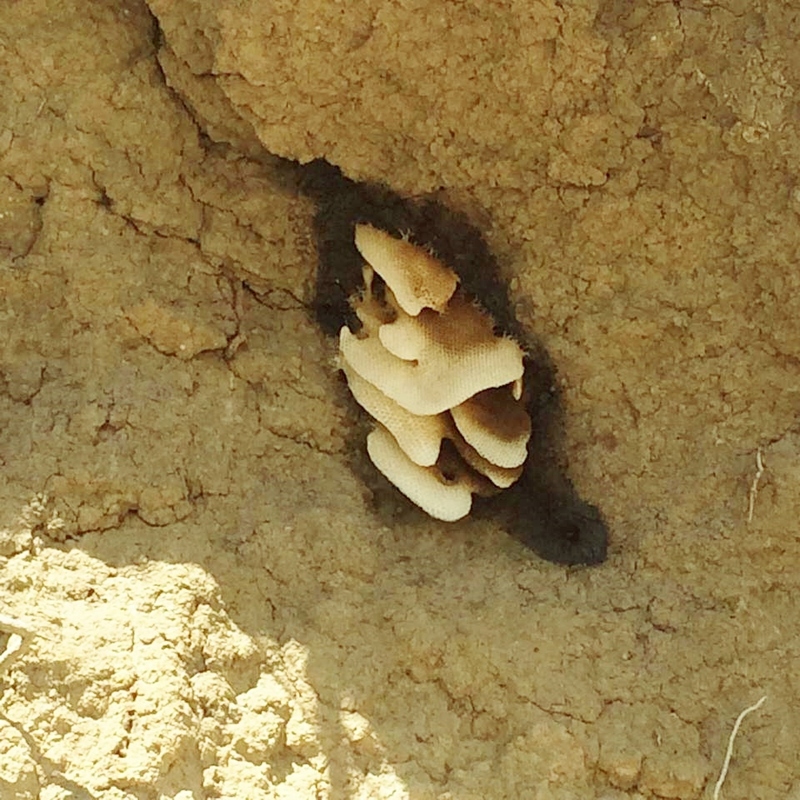 Once bees make a home within a cavity, it’s very difficult to prevent another swarm from being attracted to the smell of the previous bees which is now impregnated in the cavity material. The best way to prevent a returning swarm is to completely fill the cavity, prevent entrance to the cavity, or remove the structure completely. Materials that have been used to prevent entrance to cavities are 1/8” or smaller metal hardware cloth, steel wool, liquid nails or silicone caulking. Sand, old towels/cloth, vermiculite, or fiberglass insulation are typical materials used to fill cavities. If honey bee scout bees from the swarm cannot enter the cavity to evaluate it’s suitability as a home, they will not lead the rest of the swarm to that spot. In terms of general behavior, the bulk of forager bees (older bees) are out foraging for resources during the day. These are the bees that are mostly likely to join in defending the hive. All bees return to the hive towards the end of the day and by sundown they stop foraging and stay in the hive at night. Hives that are disturbed earlier in the day – if highly aggressive or disturbed without the use of smoke from a beekeeper’s smoker – are more of a hazard because they will have all day to remain in flight looking for potential threats. 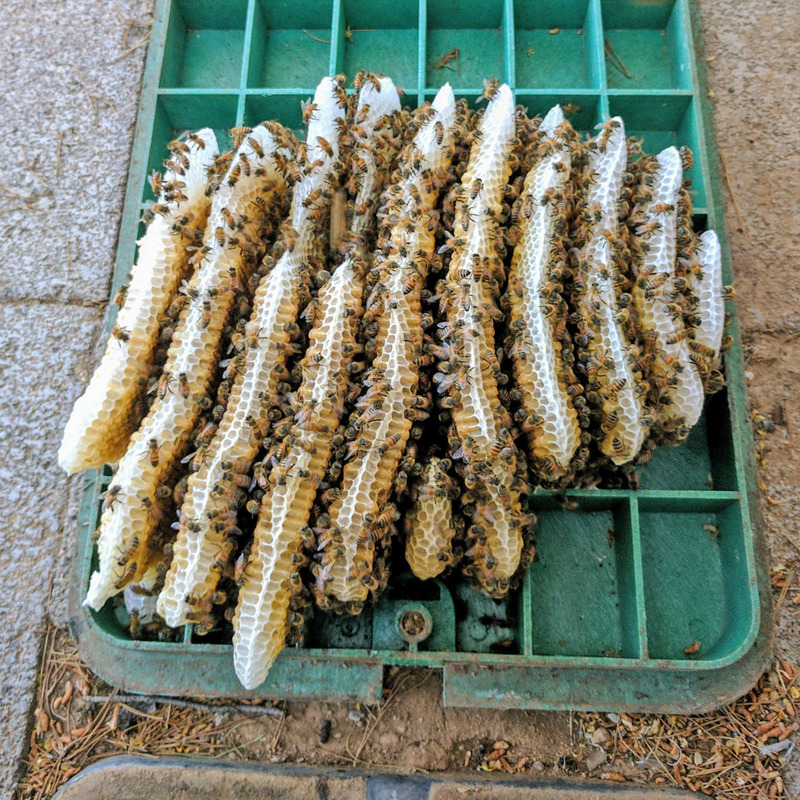 So the most critical times for diverting foot traffic around known hives or when disturbing them to relocate or exterminate, is towards the end of the day. It can take a half hour for foraging bees from the field to return to the hive, so bees should not be moved during the day unless a plan to capture the “field force” of foraging bees is in place. Active bee hives can be hard to spot for those that do not normally work with honey bees. Many times, they are not noticed until they are in the act of swarming (reproducing) or when it’s so hot that it forces a large number of bees to clump outside on the entrance forming what we call a “beard” in beekeeping terms. If you suspect honey bees around your property, a good time of day to look around is when the sun is low on the horizon. At this time bees are more easily seen flying to and from water sources back to the places indicated on the above table. Likewise, the locations indicated should be inspected a minimum of twice yearly. The best times for doing this is before the end of February, and after prime swarm season. 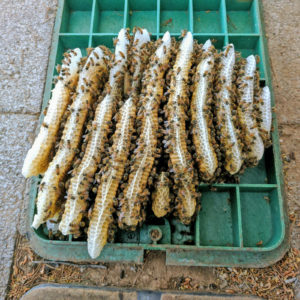 Swarm season varies depending on elevation, rainfall, and average temperature. 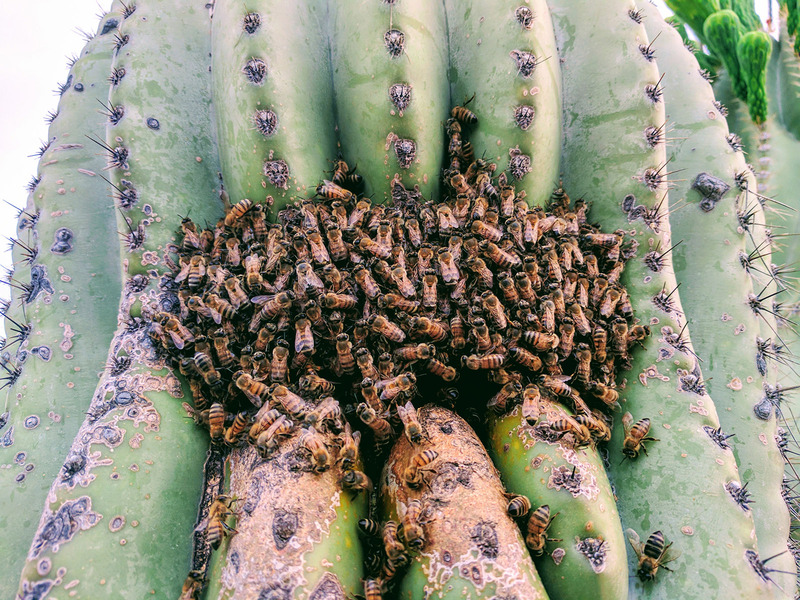 For Southern Arizona swarm season tends to extend from March 1st to June 15th. Colonies living in cavities that are more constricted in volume, or colonies with high populations in warmer locations tend to swarm sooner than those colonies in larger cavities or at slightly cooler elevations above 4,000 feet. During the summer there tends to be a lack of food resources (pollen/nectar) that can limit swarming from the most aggressive hives in more rural areas where the density of beekeepers can be lower. Unfortunately, Africanized colonies can be more aggressive at these times due to stress caused by lack of food, and they can also migrate to other locations or take over weaker colonies with European or failing queens. This absconding or usurpation tends to occur more from October through November. Care has to be taken to protect European colonies from being taken over, and this can be done with queen excluders, and ensuring your hives are strong and queenright. The more you can be aware of your surroundings the better you can prevent swarms from moving in. It is NOT acceptable to allow a swarm or established hive to stay in place without calling an experienced person for help. In addition, spraying honey bees with water, or any other substance in an effort to get them to “move on” is mostly ineffective, and you can cause them to behave in a aggressive way. Applying smoke is also not effective on a swarm. Swarms do not “rest” in the sense that they are tired and need to take a break. A stationary swarm is in the process of evaluating potential locations in the area to establish itself as a hive. Finding a swarm is an indicator that the parent colony is likely nearby – within a few hundred feet or less. After exiting the parent colony in the morning and settling nearby, the swarm will usually relocate to its final destination a mile or two away in the late afternoon where the odds are much higher it will be exterminated when it’s eventually found. Usually swarms can be collected by a beekeeper as quickly as an exterminator can kill them, and the risk is extremely low due to their docile behavior regardless of strain. However, once it moves into a cavity it’s usually considered to be an established hive by most beekeepers, and the cost to relocate them will be substantially higher in terms of money and time. Besides providing incentives for more beekeepers to organize among each other to manage docile hives, capturing swarms before they find a cavity is the most effective means to keep the number of wild colonies from increasing in number.